The selection process of party nominees for president of the United States reveals many of the undemocratic components of the American political system. As we near the end of March, we have another slew of state caucuses. Only a tiny fraction of voters attends these burdensome meetings. For example, In the state of Nevada, there are nearly 1.5 million registered voters but only 11.984 Democrats and 74,078 Republicans engaged in the February, 2016 caucuses. That’s a participation rate of under 6%. Democrats award delegates proportionally according to the popular votes of the candidates. But Republicans have numerous Winner-Take-All (WTA) states including large ones from March 15 such as Florida and Ohio. They have upcoming WTA primaries in Arizona, Wisconsin, Delaware, Maryland, Pennsylvania, Indiana, Montana, New Jersey and South Dakota. In Ohio, Governor John Kasich won 46.8% of the votes but collected 100% of the delegates. If this seems unfair, it is no different from the actual method that we have for electing our president on Election Day. We call it the Electoral College. Most reformers would like to see changes to the way in which we elect or presidents. 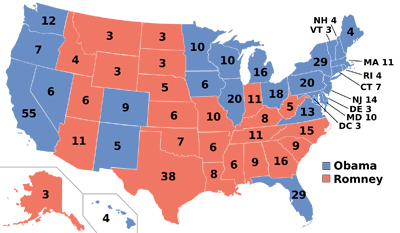 If we go back to our last presidential election, the record shows that President Barack Obama was reelected in 2012 by defeating Mitt Romney in the Electoral College by a vote of 332 to 206. Even though Obama won the popular vote by a single percentage point (50% to 49%), many consider the election to be a landslide, because Obama’s margin in the Electoral College was 62% to 38%. There are those who would like to see the Electoral College abolished. It has several clear shortcomings. First and most importantly, it is not based on the popular vote of the people. As recently as 2000, Democrat Al Gore received more than a half million more votes than George Bush. However, with the shenanigans in Florida, Bush won the Electoral College, 271-266. In a country that prides itself on one person-one vote, this was clearly a travesty. Second, in recent elections, approximately ten states have been considered swing states. This means that there is considerable uncertainty about whether they will go to the Democratic or the Republican candidate. The remaining forty states are considered to be solidly for one candidate or the other. They are considered to be sure bets for one candidate or the other. This is what happened in 2012. The three largest states in the country, California, Texas, and New York (actually tied in size with swing state Florida at 29 votes) were essentially ignored by the candidates, except for fund raising purposes. California and New York were solidly for President Obama; Texas for Governor Romney. The 82.6 million voters in these states, representing one-fourth of the population of the entire country, received virtually no visits from the candidates. There were no big rallies or parades in these states. The citizens had no value to the candidates, except for a few fat cats who provided money to the candidates’ campaigns, or the Super PACs that worked on their behalf. The Electors shall meet in their respective States, and vote by Ballot for two Persons, of whom one at least shall not be an Inhabitant of the same State with themselves. And they shall make a List of all the Persons voted for, and of the Number of Votes for each; which List they shall sign and certify, and transmit sealed to the Seat of the Government of the United States, directed to the President of the Senate. The President of the Senate shall, in the Presence of the Senate and House of Representatives, open all the Certificates, and the Votes shall then be counted. The Person having the greatest Number of Votes shall be the President, if such Number be a Majority of the whole Number of Electors appointed. To change this would require a constitutional amendment. The process for that would be for an amendment to be proposed in either the Senate or the House and then have it approved by two-thirds of the members of each chamber. That is hardly the end of it; the proposed amendment must then be ratified by three-fourths of the states, meaning now thirty-eight of the fifty states. Amending the U.S. Constitution is a cumbersome process and has not happened since 1992 when the 27th Amendment was passed. It was a relatively minor one regarding congressional salaries. Award electoral votes proportionally by state popular vote? Beneath these numbers is the reality that with proportional electoral voting by state, the outcome would be just one percent different from the popular vote. It would be much closer to the will of the people than the present Electoral College. It would clearly be a much more democratic process. However, this method would only work if all fifty states agreed to allocate their electors proportionally. The likelihood of that would be less than that of passing a constitutional amendment to abolish the Electoral College and replace it with the popular vote. Some people have suggested proportional electoral voting in each state. However, the conclusion is that while it would advance the cause of democracy, it is not a realistic proposal. Until both the federal Congress and the state legislatures see the wisdom of amending the constitution to replace the Electoral College with the popular vote, we will continue to have both an undemocratic system and one in which one candidate can win the popular vote and another the Electoral College. There has to be a better way to build a democracy. This story was originally published in 2012. It has been updated to 2016.